There are four parts to Eurocode 2; Figure 4 indicates how they fit into the Eurocode system, which includes other European standards. Eurocode 2, Part 1-1: General rules and rules for buildings9 is the principal part which is referenced by the three other parts. For the UK designer there are a number of differences between Eurocode 2 and BS 8110, which will initially make the new Eurocode seem unfamiliar. The key differences are listed below to assist in the familiarisation process. 1. Eurocode 2 is generally laid out to give advice on the basis of phenomena (e.g. bending, shear etc) rather than by member types as in BS 8110 (e.g. beams, slabs, columns etc). 2. Design is based on characteristic cylinder strengths not cube strengths. 3. The Eurocode does not provide derived formulae (e.g. for bending, only the details of the stress block are expressed). This is the traditional European approach, where the application of a Eurocode is expected to be provided in a textbook or similar publication. The Eurocodes allow for this type of detail to be provided in 'Non-contradictory complementary information' (NCCI) (See Glossary). 4. Units for stress are mega pascals, MPa (1 MPa = 1 N/mm2). 5. Eurocode 2 uses a comma for a decimal point. It is expected that UK designers will continue to use a decimal point. Therefore to avoid confusion, the comma should not be used for separating multiples of a thousand. 6. One thousandth is represented by %o. 7. The partial factor for steel reinforcement is 1.15. However, the characteristic yield strength of steel that meets the requirements of BS 4449 will be 500 MPa; so overall the effect is negligible. 8. Eurocode 2 is applicable for ribbed reinforcement with characteristic yield strengths of 400 to 600 MPa. There is no guidance on plain bar or mild steel reinforcement in the Eurocode, but guidance is given in the background paper to the UK National Annex10. 9. The effects of geometric imperfection ('notional horizontal loads') are considered in addition to lateral loads. 10. Minimum concrete cover is related to bond strength, durability and fire resistance. In addition to the minimum cover an allowance for deviations due to variations in execution (construction) should be included. Eurocode 2 recommends that, for concrete cast against formwork, this is taken as 10 mm, unless the construction is subject to a quality assurance system in which case it could be reduced to 5 mm or even 0 mm where non-conforming members are rejected (e.g. in a precast yard). It is recommended that the nominal cover is stated on the drawings and construction tolerances are given in the specification. 11. Higher strengths of concrete are covered by Eurocode 2, up to class C90/105. However, because the characteristics of higher strength concrete are different, some Expressions in the Eurocode are adjusted for classes above C50/60. 12. The 'variable strut inclination' method is used in Eurocode 2 for the assessment of the shear capacity of a section. In practice, design values for actual structures can be compared with tabulated values. 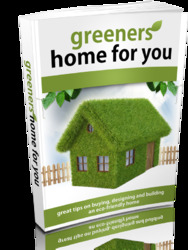 Further advice can be found in Chapter 4, originally published as Beams'". 13. The punching shear checks are carried out at 2d from the face of the column and for a rectangular column, the perimeter is rounded at the corners. 14. Serviceability checks can still be carried out using 'deemed to satisfy' span to effective depth rules similar to BS 8110. However, if a more detailed check is required, Eurocode 2 guidance varies from the rules in BS 8110 Part 2. 15. The rules for determining the anchorage and lap lengths are more complex than the simple tables in BS 8110. Eurocode 2 considers the effects of, amongst other things, the position of bars during concreting, the shape of the bar and cover. 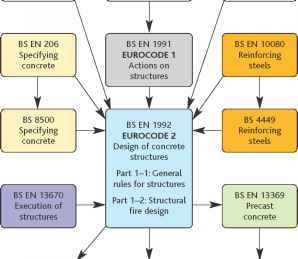 Eurocode 2, Part 1-2: Structural fire design"2, gives guidance on design for fire resistance of concrete structures. 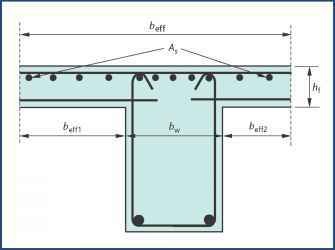 Although much of the Eurocode is devoted to fire engineering methods, the design for fire resistance may still be carried out by referring to tables for minimum cover and dimensions for various elements. These are given in section 5 of Part 1-2. Further advice on using the tabular method is given in Chapter 2, originally published as Getting started13. Eurocode 2, Part 2: Bridges14 applies the general rules given in Part 1-1 to the design of concrete bridges. As a consequence both Part 1-1 and Part 2 will be required to carry out a design of a reinforced concrete bridge. Eurocode 2, Part 3: Liquid-retaining and containment structures"5 applies the general rules given in Part 1-1 to the liquid-retaining structures and supersedes BS 8007"6.